design in 3D, build in 3D, live in 3D! DESIGN and COMMISSIONING Technical Designs was the Engineering Desing firm and building commissioning agent. This project achieved LEED Gold rating in Northern Nevada. Technical Designs provided innovative mechanical design features to this project. 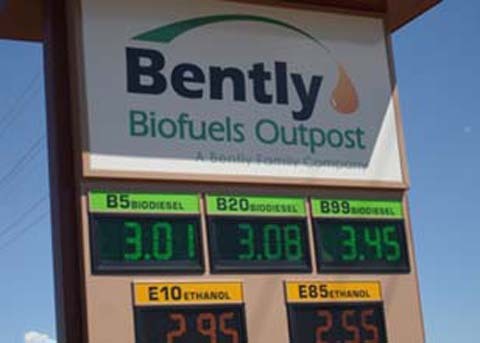 The design includes first stage heating from solar panels and the boilers that back up the heating system are fired from the biofuels delivered and sold on site. The domestic hot water is fed from indirect hot water tanks supplemented by the solar heating system. Technical Designs commissions the new Reno Tahoe FAA Control Tower. In line with Technical Designs' goal of providing a complete package of LEED design services, Technical Designs has on staff, AABC / ACG certified commissioning agents. Sustainable design, construction and operation / management practices drive today's construction market. Sustainability is the goal and LEED is the measuring stick. Explore LEED and how Technical Designs helped the Boyd Gaming Laundry Facility in Henderson, NV obtain LEED certification. Controls and Energy Strategies that work. Three merging trends began to make designing with legacy control stragegies impossible: 1) the trend toward more factory mounted controls and less field installed components; which has led to finger pointing between vendors and control installation companies, as to what is provided and by whom? 2) the incorporation of more smart devices and communication protocols (see url) and 3) the desire to use more sophisticated control strategies that incorporate “smart” energy savings such as automated demand response and LEED building control strategies and features. Technical Designs set out to find a better method to manage this problem for our Clients. The result was the ability to write the building control software, test this software off line, hand this software off to the installing contractor and manage the commissioning process over the web from anywhere in the world. Using VMware and web tools, the engineers at Technical Designs that conceived how the building was to perform, now verify this in real time. Just as designing in 3D does not allow you to “fake” it, no longer will the engineer be allow to throw a few half baked ideas at the control contractor expecting everything to magically work. Technical Designs became interested early on in the use of Integrated Project Delivery (IPD) . IPD is simply the use of web based tools that support consultants with specific expertise to collaborate on a single design model that exists in the cloud where team members have direct access in real time. This process could be applied to any type of project: from designing a circuit board to movie production. Technical Designs focused on what knowledge we bring to the process and developed the tools and skills necessary to support the building design process within the construction industry. Technical Designs are engineers... focused on what knowledge we bring to the process and developed the tools and skills necessary to support the building design process within the construction industry. Technical Designs are designers... focused on what knowledge we bring to the process and developed the tools and skills necessary to support the building design process within the construction industry. Technical Designs makes it work... focused on what knowledge we bring to the process and developed the tools and skills necessary to support the building design process within the construction industry.